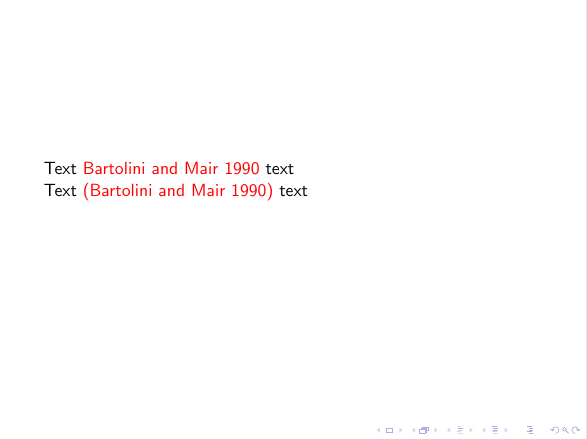 I try to color the in-text citations in my beamer presentations. I use several citations per item, mostly via \parencite. To increase readability I want the references (including brackets) to be printed in grey. Unfortunately all the solutions and workarounds (Citation colour with Beamer + Hyperref + Natbib, Beamer: Biblatex biber, change color of citations globally and Beamer ignores citecolor from hyperref) won't do the trick. Either all the links (sections and subsections) are colored or nothing changes. Not the answer you're looking for? Browse other questions tagged beamer biblatex hyperref color or ask your own question.